Even though this January day feels like spring outside, it's still January, so there are limited pickings available even in our glasshouse. 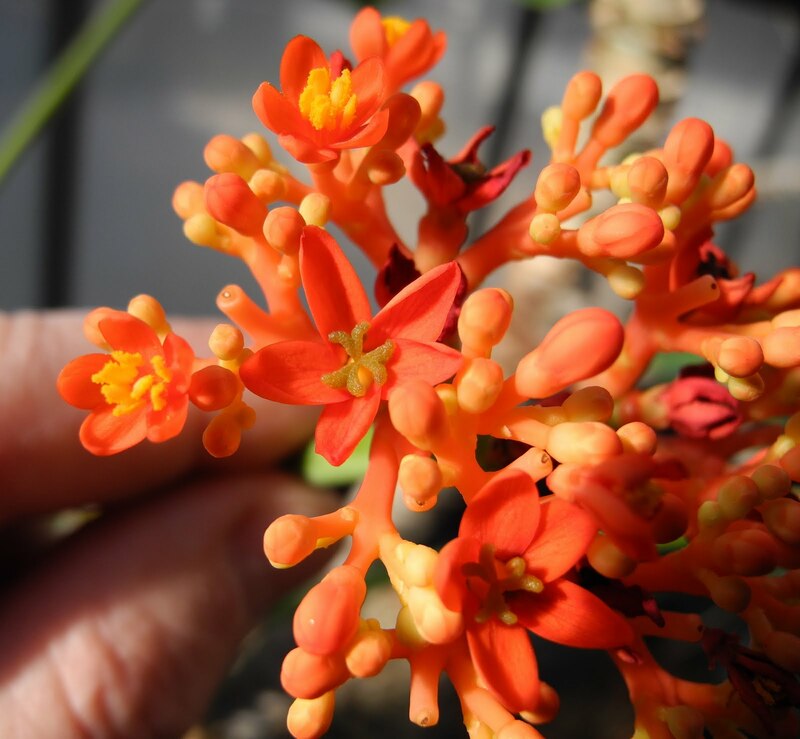 However, over on the succulent bench, one of the pachycaulous (thick-stemmed) succulent euphorbs is flowering, Jatropha podagrica, sometimes called bottle plant because the stem abruptly widens toward the base. While it is generally grown as a curiosity because of its thick stem even on a quite young, quite small plant, the rounded inflorescences standing out above the foliage are quite showy. Here's a close up showing the unisexual flowers characteristic of euphorbs (staminate flower to the far left, a slightly larger pistillate flower to its right with the 3-branched stigma showing prominently). The inflorescence i s a cyme and the pistillate flower always occupies the terminal, central position. Even after the pistillate flowers get pollinated, drop their perianth, and begin to develop as fruit, the inflorescence continues to produce staminate flowers. This plant is easily grown if you have a warm, sunny enough window and can avoid over watering. The pachycaul image is courtesy of Bouba via the Creative Commons. How does you know if you're winning? Wildlife friendly lawns - Not! Can a film dinosaur adapt to the digital age? Fun and Games with super PAC, man! What if winter never comes? Who invented the dichotomous key?